THe Big Blue POOL - A huge, zero-depth entry pool with underwater speakers AT DISNEY'S Art of Animation Resort. Disney's Art of Animation Resort has three wonderfully theme pools but we are focusing on the Big Blue pool because of its zero-depth entry pool that provides shallow spaces for little people to enjoy and the accompanying Schoolyard Sprayground and Squirt's Righteous Reef dry play area. Did you know that The Big Blue pool is the largest hotel pool of any the Disney World hotels? It holds over 308,527 gallons of water and even has underwater speakers so that you can hear your favorite Disney songs under water. The Drop Off pool bar is a nice feature for parents who want to enjoy snacks and a refreshing beverage. This hotel also has a crazy cute Cozy Cone pool inspired by the Disney-Pixar movie Cars and a delightful Little Mermaid pool. Family suites make up the bulk of the accommodations at this resort though there are two buildings with standard rooms in the Little Mermaid area. Squirt's Righteous Reef Dry Play area - ONE OF THE BEST CHILDREN'S pools IN THE DISNEY WORLD VALUE RESORT CATEGORY. Schoolyard Sprayground Wet Play AREA - ONE OF THE BEST CHILDREN'S Splashzones IN THE DISNEY WORLD VALUE RESORT CATEGORY. Because there are so few standard rooms at Disney's Art of Animation resort, we wanted to include Disney's Pop Century Resort and Disney's All-Star Movies resort which will be less expensive. The bright decor and easily recognizable Disney characters featured at these hotels make them a hit with young kids. Both resorts will have dry playgrounds for the kids. Disney's All-Star Movies has two cute themed pools though guests are welcome to enjoy the pools at Disney's All-Star Music and Disney's All-Star Sports resorts too. Disney's Pop Century has three themed pools. KIDDIE POOL AT DISNEY'S All-Star Movies RESORT - ONE OF THE BEST CHILDREN'S SPLASH ZONES IN THE DISNEY WORLD VALUE RESORT CATEGORY. Kiddie Pool at Disney's Pop Century Resort - One of the best children's splash zones in the Disney World value Resort category. Disney's Caribbean Beach Resort features comfortable rooms and a gorgeous resort setting. The Fuentes del Morro Pool is a Spanish fort themed pool with a zero depth entry that provides shallow areas for youngsters to enjoy along with two waterslides that will appeal to older kids and adults. The Shipwreck wet play area is a hit with kids looking to splash and slide and get good and wet. There are six smaller "leisure" pools sprinkled throughout this resort. Tip: This is a very large resort so we highly recommend getting a preferred location room; it costs a little more but your feet with thank you when you're headed back from a fun day in the Disney theme parks. Pirate Shipwreck wet play area for children at Disney's Caribbean Beach Resort - One of the best splash zones of the Disney World hotels, moderate resort category. Disney's Port Orleans French Quarter Resort is a compact and lovely resort that's smaller size is an ideal choice for families with young children. The Doubloon Lagoon pool with its sea serpent waterslide is fun choice for families though it does not feature a zero-depth entry. 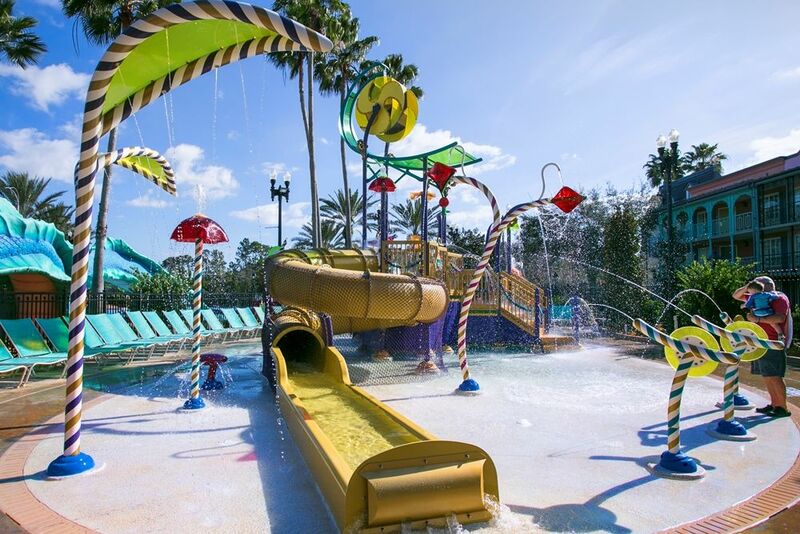 The resort just opened a delightful and colorful water play area for kids. Guest are also welcome to enjoy the Ol' Man Island Pool area an the Disney's Port Orleans Riverside resort. We love this resort but, because of its small size and popularity, it does get excluded from many Disney World discounts and promotions so you may want us to compare the cost of another moderate resort. Children's Wet Play area at Disney's Port ORleans French Quarter Resort - ONE OF THE BEST SPLASH ZONES OF THE DISNEY WORLD HOTELS, MODERATE RESORT CATEGORY. Alice in Wonderland WET PLAY AREA FOR CHILDREN AT DISNEY'S Grand Floridian RESORT - ONE OF THE BEST SPLASH ZONES OF THE DISNEY WORLD HOTELS, DeluxE RESORT CATEGORY. Disney's Grand Floridian Resort is a beautiful resort on the monorail loop in the Magic Kingdom area and it has a lot to offer families with young children. You have your choice of either a boat or the monorail over to the Magic Kingdom and you can see the Wishes fireworks and the nightly Electric Water Pageant (floating light display) from many areas of this hotel. There is an on-site character meal (breakfast and dinner) and it is easy to pop over to the Disney's Polynesian and Contemporary resorts to enjoy the shopping and dining options there. There are two zero-depth entry pools at the Disney's Grand Floridian resort that are so lovely that they'll tempt you away from the Disney theme parks! The Alice in Wonderland themed splash play area is fun and sure to soak you to the skin when the Mad Hatter's hat tips and the water inside cascades down over the play area. Courtyard Pool with zer0-depth entry and WET PLAY AREA FOR CHILDREN AT DISNEY'S GRAND FLORIDIAN RESORT - ONE OF THE BEST SPLASH ZONES OF THE DISNEY WORLD HOTELS, DELUXE RESORT CATEGORY. Click here for Disney's Grand Floridian photos & information. Disney's Animal Kingdom Lodge is one of my personal favorites because the resort is just so unique! This incredible resort features several savanna areas with African animals that can be viewed from some of the rooms and from the public areas of the resort. The Jambo House area has the 11,000 square foot Uzima Pool with waterslide that feels like you're in a tropical paradise. The Kidani Village area of the resort features the Samawati Springs pool complex here is just amazing! In addition to the zero-depth entry pool with water slide, there is an extensive kids play area called Uwanja Camp with 3 distinct zones for kids of all ages. The Observation Station was designed with kids age 4 and younger in mind and has climbing and play features and a shallow wading pool. The Departure Zone has a leaky water tower and squirting African irises that are perfect for kids age 5 to 7. The Base Camp features water cannons and fun for kids age 8 and up. The Departure Zone wet play area in the Samawati Springs pool complex at Disney's Animal Kingdom Lodge - Zidani Village - ONE OF THE BEST SPLASH ZONES OF THE DISNEY WORLD HOTELS, DELUXE RESORT CATEGORY. Children's slide IN THE zero-depth entry pool at the SAMAWATI SPRINGS POOL COMPLEX AT DISNEY'S ANIMAL KINGDOM LODGE - ZIDANI VILLAGE - ONE OF THE BEST SPLASH ZONES OF THE DISNEY WORLD HOTELS, DELUXE RESORT CATEGORY. Disney's Polynesian Village Resort has a lot to offer families - the resort is on the Magic Kingdom monorail loop, has a great island theme, an onsite character breakfast, good restaurants, and beautiful pools including this spacious splash and climbing zone. Guests here can also enjoy watching the nightly Electric Water Pageant (floating parade) and the Magic Kingdom fireworks from the resort. Disney's Saratoga Springs Resort - If you're looking for fun pools, this resort has certainly got them! The High Rock Springs pool is lovely and features a small Donald Duck splash area. The Paddock Pool area has a great slide for older kids and a fun wet play area for younger guests. I think the horse shaped water cannons in the Grand Stand pool area are SO cute! Tip: This is a huge, sprawling resort with its own internal bus system. Because it is close to golf and Disney Springs, it is a great choice for families who don't want want to spend all their time in the theme parks. This resort doesn't feature standard hotel rooms but has studio units with one queen bed and one sleeper sofa or one, two and three bedroom villas. They also have some neat treehouse villas. You can use the buses but most guests at this resort find it much easier if they have a car available. THE Grand Stand Pool's WET PLAY AREA IN THE AT DISNEY'S Saratoga Springs REsort - ONE OF THE BEST SPLASH ZONES OF THE DISNEY WORLD HOTELS, DELUXE RESORT CATEGORY. THE Paddock POOL'S Splash zoneAT DISNEY'S SARATOGA SPRINGS RESORT - ONE OF THE BEST SPLASH ZONES OF THE DISNEY WORLD HOTELS, DELUXE RESORT CATEGORY. Donald Duck Splash AREA IN THE High Rock Springs pool area AT DISNEY'S SARATOGA SPRINGS RESORT - ONE OF THE BEST SPLASH ZONES OF THE DISNEY WORLD HOTELS, DELUXE RESORT CATEGORY. Disney's Beach and Yacht Club Resorts - These resorts don't have a splash zone but you cannot have a credible conversation about Disney World pools and not include Disney's Beach Club and Yacht Club resorts. Stormalong Bay is a 3-acre, 750,00-gallon sand bottomed pool that is like a beach side paradise. The pool features sweet little slide and wading area for little ones and a larger slide for older kids; there is also a lazy river, and a shallow beach area where you'll always find busy little bodies at work with their shovels and pails. SAndy beach AREA IN the Stormalong Bay Sand bottom poolAT DISNEY'S Yacht and beach Club RESORTs. Children's waterslide and wading Pool IN THE STORMALONG BAY SAND BOTTOM POOL AT DISNEY'S YACHT AND BEACH CLUB RESORTS. *Source: The Unofficial Guide to Walt Disney World 2016, by Bob Sehlinger & Len Testa, pages 382 & 387.